The bungalow in Teulada has 3 bedrooms and has capacity for 8 people. The bungalow is comfortable, is fully-equiped, and is 120 m². It has views of the sea and the mountain. 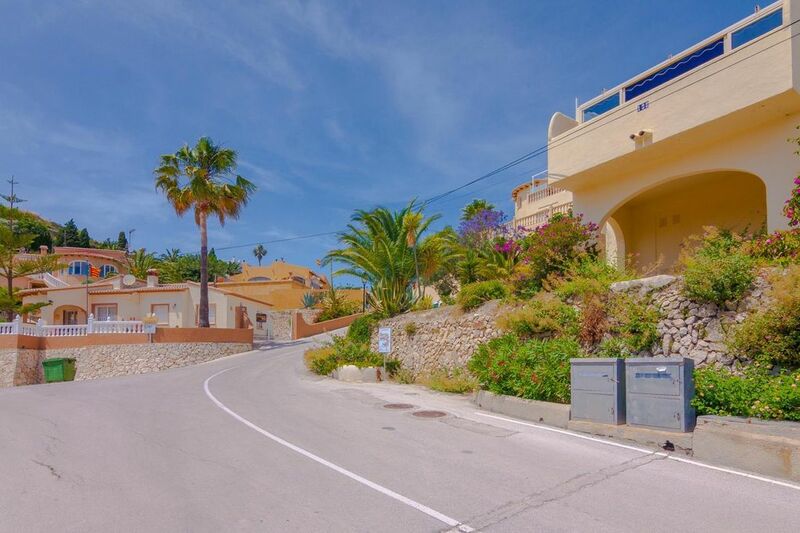 The property is located 6 m from Club de Golf Jávea, Ctra. Jávea-Benitachell, km. 4,5, 03730 Jávea, Alicante golf course, 2 km from Teulada,Alicante supermarket, 2 km from Teulada,Alicante city, 8 km from Moraira sand beach, 8 km from Moraira rock beach, 91 km from Aeropuerto Alicante-Altet, 03195, Alicante airport. The house is situated in a family-friendly neighborhood in a suburb. The accommodation is equipped with the following items: garden, garden furniture, fenced garden, 30 m² terrace, iron, internet (Wi-Fi), balcony, tennis court, electric heating, communal+children's swimming pool, open-air parking in the same building, 1 TV, tv satellite (Languages: Spanish, English, German, Dutch, French). In the mixed: gas and electric independent kitchen, refrigerator, microwave, oven, freezer, washing machine, dishwasher, dishes/cutlery, kitchen utensils, coffee machine, toaster, kettle and juicer are provided. The delightfully rustic township of Benissa lies in the northern part of the province of Alicante and the Valencia region. It is one of the oldest municipalities on the Costa Blanca, with a population of 12’400 covering around 28 square miles. Benissa��s three miles coastline of sandy beaches, clear water, high mountains, and wide valleys, as well as its inland wine orchards and unusually green landscape make for quite a unique little Spanish town. Here, charming narrow streets and old houses with iron-worked window details form the décor of an authentic Spanish way of life. It is a place where local merchants offer their traditional goods with true pride. Stop for lunch at a local pub in the historic district and try the famous Benissa-style sausages with a cold pint or a glass of good wine. You will be absolutely captivated by the town��s Spanish intimacy. Many towns along the Costa Blanca were founded during the Moorish occupation, and were consequently given Arabic names. Thus, also: Beni Isa, which means ‘sons of Isa.’ Moorish influences have, over the years, given Spanish culture an Oriental streak that is still evident today. In 1248 Jaime I of Aragon brought Benissa under Christian rule, but because all available military resources in the area were spent fighting Berber pirate raids (especially during the 15th and 16th centuries), the town’s population remained primarily Moorish. A definitive expulsion of the Moors did not occur until 1609, when people from Catalonia, the Pyrenees, and Aragon began to settle in Benissa. During the late 80s and early 90s the town experienced a large-scale renovation of its historic district to combat obsolescence and the strains of time. Benissa ’s 17th and 18th-century houses, narrow streets, churches, and town hall were all improved, resulting in a reborn, radiant town. Benissa ’s surroundings are seductively beautiful. Its landscape, lighting, Mediterranean flora - everything is in harmony. The natural environment of the surrounding area is well-protected by the government, a policy that has done well in preserving the town’s authentic ambiance and character. Situated between the Costa Blanca’s spectacular cliff and rock formations and a high mountain range in the hinterland, Benissa and its geographic location truly make it an unforgettable place. A short tour by car will lead you past old fincas nestled against spacious wine orchards and a beautiful overall Mediterranean panorama. Be stunned by Benissa´s three miles coastline that connects the towns of Moraira and Calpe. Here you will find rustic little bays where the infinity of the horizon blends with an endless blue sea, where you can relax and recover from the hassles of everyday life, and where the view is truly breathtaking. The best known beach is Fustera, endowed with a Blue Flag, and equipped with excellent facilities for children. Fustera has fine sand and a small marina with a sailing school and diving centre. This is the ideal place for various watersports, such as windsurfing and sailing. The beaches of Cala Pinets en L’Advocat are a combination of sand and rock formations. The idyllic bay of Baladrar is marvelled for its bright, deep blue water and sleepy pines that mirror in the calm waters of the Mediterranean Sea. If you are looking for complete peace and privacy, then this beach is the best retreat. Because of its unique location, you will picture yourself in another world. The medieval town centre, with its plaza, narrow streets, and churches, has been preserved astoundingly well. Balconies with typical iron-worked detail and coats of arms adorn the historic buildings. Benissa has a strong Catholic tradition that runs throughout the town. The Franciscan order produced many followers, who spread out over all of Spain . The most prominent piece of cultural heritage is the neo-Gothic Cathedral de la Marina. This white church was built in the 1920s, commissioned by the wealthy freemasons of Benissa. It was inaugurated in 1929 during the festival of St Peter. The cathedral is 59 metres long, 29 metres high, and has an imposing altar honouring the town’s patron saint Nuestra Purisima Xiqueta (Our Holy Virgin). The distinctive lighting on the altar is something you cannot afford to miss. A stroll through the town will lead you through the historic centre, with its impressive 15th-century market place, the Lonja de Contrataci����n (the oldest building in Benissa , which also serves as the Ethnographic Museum ), past the town hall (a former hospital for the poor), and the Palacio de los Torres-Orduña (now the cultural centre and local library). Here you will also find the Casal de la Joventut ����������� an old prison that today is a youth centre. Just outside the town past the huertas (farmland) you will find the routes along the Costa Blanca that the Ribereros (seasonal rice-harvest workers) used in order to trek to the Valencian coast. These days a monument honouring the Ribereros is the symbol of Benissa. Guided tours are given on most working days. Benissa ���s rough landscape lends itself perfectly to sports such as rock climbing, hiking, and horseback riding. Routes are marked out for you and will lead you along the Sierra de Bèrnia, La Solana, Oltà, and Mallà Verda. Should you be more interested in water sports, you will find the Club Náutico ��Les Bassetes��� to offer everything you could wish for: 80 moorings for boats up to 8 metres, an experienced sailing school, and a professional diving centre. Here you can also find opportunities for kayaking, wind surfing, catamaran sailing, and fishing. It is impossible to be bored in Benissa. ‘Discovering Benissa ��� also means getting to know her tastes and aromas. The Valencian kitchen comes into its own with Benissa �������������s abundance of dishes. Blends of herbs, spices and local products from both sea and land are prepared in centuries-old traditional ways to make dishes for those who enjoy the finer things in life, from amateur to experienced connoisseur. Try the Borreta de Melva (fish stew), Mullador de Pelleta (fried vegetables), Sang amb ceba (blood sausage with onions), Putxero de polp (octopus stew), Mullador de sangatxo (fried tuna), Coques al calfó (cornbread). But the variety of rice dishes, too, is endless and comes in all forms: arròs al forn (baked rice), arr����������������s amb faba pelada (rice with peeled beans), arr����s amb fèsols i naps (rice with pork, beans, and cabbage), arr��s de senyoret (rice and seafood), arr��������������s a banda (rice cooked in fish bouillon), and many, many more A special note about Benissa sausages: Benissa made a name for itself with this traditional product, for which the recipe is passed down from generation to generation, thus belonging very much to the town’s culinary heritage. The care and effort of the local sausage producers have succeeded in turning an ordinary sausage into a meal fit for the gods. - Cabalgata de Reyes January 5 Three Kings, celebrated with an impressive parade. - Fira i Porrat de Sant Antoni January 7 – February 1 Festival of St Anthony – during this 20 day-long festival the town offers many attractions to both young and old, such as a medieval market with vendor stalls, birds of prey, and jesters; the blessing of animals, livestock market, fair, and many other games and cultural attractions. - Semana Santa Holy Week During Holy Week you can enjoy religious, classical, and antique music concerts. - Fiestas Patronales de la Purísima Xiqueta starting the 4th Sunday in April Festival of the Holy Child (holy patron of Benissa ). Each municipality has its own patron saint and thus also its own festival. In practice, all the preparatory work is done during the preceding week, and the town celebrates 24 hours a day with parades, dance parties, live music, sporting events, fireworks, and crowning of the Queen of the Festival. - Running of the Bulls April 28 - 30 Bull running is organised even in Benissa . Large, specially-bred bulls are released into the streets to chase the daredevils who believe themselves fast enough. Hundreds of people watch from higher vantage points while the fear-driven herd of bulls keep on coming. Definitely not an event for the animal rights activist in your family. - Moros i Cristianos last week in June The festival of the Moors and Christians has been celebrated on the Costa Blanca for a very long time. This is not surprising, since the struggles which occurred here between the 12th and 16th are firmly rooted in Spanish history. The festival is a dramatic performance marked by colourful costumes, bombastic music, and re-enacted battles from times long lost. We offer you a complete selection of holiday accommodations: luxury villas on the coast, rustic fincas a little further inland, holiday apartments in the historic district…. We have carefully selected quality accommodations for every preference and budget so you can relax and enjoy your well-earned holiday.